At Quonquont, we kick off the fruit season with big, delicious blueberries bursting with flavor. And nothing says “delicious” like blueberry pie. Preheat your oven to 375 degrees Fahreneheit, then prepare your pie dough, rolling out both discs of dough until they are approximately 1/4-inch thick or less. Each should be about 10 inches in circumference. Line a glass pie dish with one of the crusts, and set one aside. Add all pie filling ingredients into a bowl and stir to combine. The amount of sugar you use is up to you. For a more tart-sweet pie, use 1/4 cup. For a more traditional, fully sweet pie, use up to 1/2 cup. 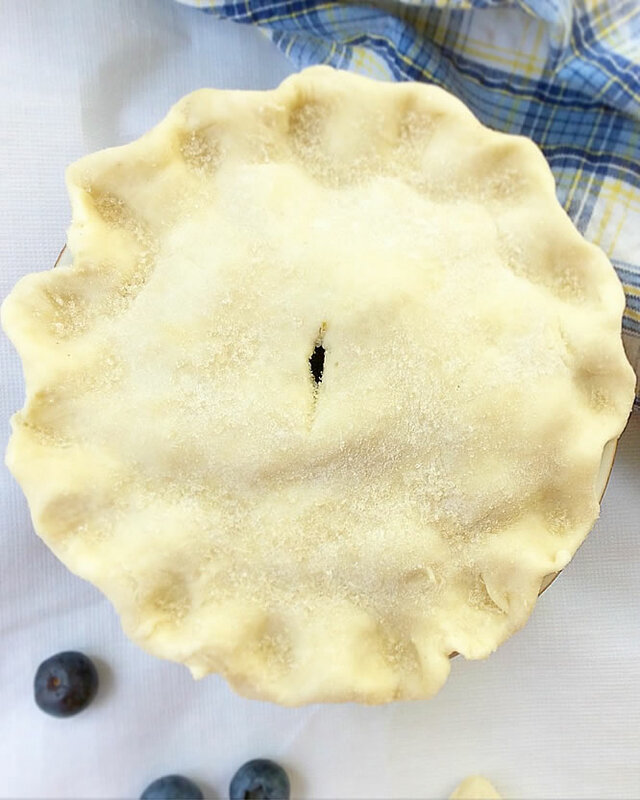 If you’re not sure which amount would be best for you, split the difference and go with 1/4 cup + 2 T for your first pie. Dump blueberry filling into prepared pie pan, and top with remaining dough. Use your fingers to tuck any overlapping dough under the edge of the bottom crust, and either crimp with your fingers, or seal with the tines of a fork. Sprinkle the top of the pie with a pinch of sugar, and poke 1-3 holes in the top to let out steam as it bakes. Bake in the lower third of your oven for 45-60 minutes, or until top crust is golden brown and filling is bubbling. Baking on a lower rack helps keep the bottom crust from getting too soggy and the top from burning. If, after 45 minutes, your pie still isn’t golden brown, cook for an additional 15 minutes, checking every 5 to make sure it doesn’t over cook. Remove pie from oven and let cool for at least 20 minutes, but ideally an hour, to let the liquid set in the pie. Pie is best eaten on the day it’s made, though will keep for 2 days on the counter, if necessary.